Steve Shallenberger: Welcome to our Becoming your Best Podcast, listeners, wherever you may be in the world today! This is your host, Steve Shallenberger, and to introduce this subject, today, I would like to share a story about how one word can make a difference. Have you had this experience where you just have something inside of you, and you can’t find the word to properly express it, and as soon as you can have this idea pop into your mind, it changes everything. Well, I had one of those experiences and it’s taken, like, over a year, I had something building up inside, but I couldn’t think of the way to describe it. I had a concept in mind, and it was Compound Interest. You all know about Compound Interest, but that was not it! Steve Shallenberger: As you know, compound interest refers to the compounding power of your investments that, with time, as you consistently and regularly put in what may appear to be a modest amount of money, ultimately grows at an exponential rate to become disproportionately large. An example of this is, if you stick $10,000 in the bank, just one time and leave it there, and you get an 8% return, well, in 30 years that $10,000 would be worth $100,000, and in 40 years, this is the compounding power, $217,000 and if you leave that original $10,000 there for 50 years, it becomes almost a half of million dollars. So, what was the missing word that I was looking for to describe this message in my heart? I knew it was a cousin to compound interest and what seemed to me to be a profound idea that applied to consistent behavior, I just couldn’t find it, but last week I was in Malta and the word flashed into my mind! And it was IMPACT! That was it! The value of COMPOUND IMPACT! There I had it! Instantly, I found a way to describe what was pent-up in my mind and heart. The Value of Compound Impact. We might refer to it as CI. A way to describe the value or power of what might seem like a tiny, but consistent, repetitive behavior. And just like there is a huge value in compound interest, there is a huge value in compound impact. Steve Shallenberger: Albert Einstein once noted that the most powerful force in the universe was the Principle of Compounding. And in the natural world, there are some examples here. Building a reservoir, for example, is the result of the value of compound impact. Build the dam, letting the water build up and soon, the result goes from empty to overwhelmingly full. The impact of apparently small acts becomes enormously significant with time. Another example from the natural world is the relentless impact of the disease that is called, “Glaucoma.” it’s an eye disease. Essentially, this is an issue of having high pressure levels in the eye, inside the eyeball, and is the equivalent, the action, of a bead of water. just imagine a bead of water constantly and consistently hitting against the optic nerve, in the back of your eye, which, with time, starts unraveling and eventually is destroyed, resulting in the loss of your optic nerve and your sight. Well, these are great examples of this impact, if you will, compounding impact. When you think of the compound impact of something, it is so easy of thinking of doing that “thing” just one time. That seems innocent, doesn’t it? Just one time. But the fact is, things don’t end up being just one time. And when you think of doing an act, really think, and this is the mindset of compound impact, think of doing that thing one time X 365 days X 10 years, or 20, or 50 years. I invite you to consider what are the compound impacts in your life, your team, and your organization. Steve Shallenberger: So, let’s have a little fun considering the impact of some of these Compound Impacts. I’m going to alternate between positive and negative impact items. Let’s start with Money. I’ve already referred to that, about compound interest. Creating a base fund, and consistently adding a small amount, will build into a significant amount. Recently, one of our key employees, Mary we’ll call her, commented to me, and she said, “I am so grateful that you persuaded me to start participating in the company 401K, five years ago.” She has actually worked for our company 13 years and had not yet taken the leap to participate in the 401K, even though our company will match the employee’s investment, if you will, with a 50% matching. Well, Mary proudly proclaimed that just after a few years, she now has a sizable pot of money already and it continues to build. She has now over $15,000 in her savings account. And she commented, “I don’t even miss the money taken from my paycheck.” So, a great practice here in the value of Compound Impact, in this case, also aligning with compound interest, is simply set aside. Not so easy, sometimes, but it is a mindset to have it. 10% of what you earn for savings and watch it grow. I did a previous podcast on the Richest Man in Babylon. It is hands down one of our most popular podcast that we’ve done and worth referring to not only your children or family members, friends, but also to your employees. And it literally underscores what we’ve just talked about, and how putting aside a small amount of money has a big impact. Steve Shallenberger: All right, well, let’s shift to the bad side of the ledger here, a second. I have to laugh because the one that I’m going to use is definitely one of my weak spots. If I’d say I’m addicted to anything, it’s gotta be sugar. So let’s take Dessert as an example. And all of us fight this, right? I presume I’m not alone here. We’re all interested in health and vitality. Dessert seems to play a big part of that, and don’t get me wrong, I’m not against enjoying a great dessert, but it also can represent a real threat. Statistics show this clearly, that sugar can have such huge negative impacts in our lives. So, remember it’s not just one dessert, it’s not just one cookie. It is 1 X 365 X 10, 20, or 50 years. You most likely have a stronger will power than I do, and please do not put a yummy chocolate chip cookie in front of me. But I guarantee it is not just one for me. If I see chocolate chip cookies, I’d love to have more than one. So, think of the opposite of the value of Compound Impact of not having the sweets 1 X 365 days. I’ll just repeat, that doesn’t mean you can’t have a “bonus” day to indulge, but the Compound Impact will produce a real long-time healthy set of results when aligned the right way. For example, on the negative side of things, let’s say that a cookie weighs 3 ounces X 365 days. That would be 1,095 ounces in a year. Divided by 16 ounces, which is 1 pound and 16 ounces, that would be the equivalent of eating 68 pounds of cookies and sugar, over a year period of time. Can you imagine that 68 pounds of cookies? That’s called, “Compound Impact.” And over a 10 year period, that’s 680 pounds! What COMPOUND IMPACT does that have on your body? Steve Shallenberger: Okay, well, back to the positive side of the ledger. Imagine the Compound Impact of simple exercise. Dr. Fotuhi, a world renowned expert in Neurology, including his focus on longevity and health, has done intensive, deep research on this whole area. And his research has shown that walking one mile, three times a week, will grow your hippocampus, this little feature at the bottom of your brain there, it is the gateway to brain and body health and longevity. If you would walk one mile three times a week, will increase the size of your hippocampus by 23%. If that is the case, think of the impact of one mile, in this case, say you did it 250 times a year X 10, or 20, or 30 years. Over 10 years, that is 2,500 miles walked. The value of the compound impact here, will result is better weight, extended life, improved health, and vitality and energy. Steve Shallenberger: Okay, back to the bad side of things. How about the compound impact of negative thoughts, comments or a frame of reference? Remember, this is not just one day, this is a way of living. It is 1 X 365, or perhaps multiple times per day because the thoughts or the words, simple words would take a fraction of a second, X 10 years, that’s 3,650 days over that period of time, or of negative thinking, holding bad feelings, or a grudge, or not forgiving. That compound impact is devastating and robbing you of years of happiness, prosperity, and health. Think of all of those. Just in that short period of time, if you have, say, three negative thoughts in a day, over that period of time, it’s 10,000 dark feelings and life is too short. So, why does having a positive frame of reference, on the flip side, have such a big impact in your life? Research shows that a positive attitude affects your success in business, work, and life, in a dramatic way. Why does that matter? Well, the top 25%, research shows, of optimistic people, had 39% less risk of heart disease or a stroke and 52% less risk of dying from an infection. Let me tell you a little bit more about this, because the study analyzed data from 2004 to 2012, from 70,000 women enrolled in the Nurses’ Health Study, a long-running study tracking women’s health via surveys, every two years. They looked at participants’ levels of optimism and other factors that might play a role in how optimism may affect mortality risk, such as race, high blood pressure, diet, and physical activity. The most optimistic women, the top quartile, had a nearly 30% lower risk of dying from any of the diseases analyzed in the study, compared with the least optimistic, the bottom quartile. And that’s what the study found, the most optimistic women had 16% lower risk of dying from cancer, 38% lower risk of dying from heart disease, 39% lower risk of dying from stroke. This is where these results came from, 38% lower risk of dying from respiratory disease, and 52% lower risk of dying from infection. So, this is what we’re talking about, the value of compound impact. Research has also shown in other studies, optimistic sales reps sell 56% more than their pessimistic peers. And in a study, “Chronic Complainers”, have found that the hippocampus shrinks and there are significantly higher cortisol levels which lead, of course, to increased risk of heart disease and diabetes. Steve Shallenberger: So, if the compound impact of negative thinking, mean comments, cutting other people down is devastating, imagine the impact of the opposite of making kind, thoughtful and upbeat comments, multiple times every day. One time X 365 days X years. Imagine what a sweet bonding power that would be on your relationships. Imagine the positive light that you are wherever you go. The greatest value of the compound impact of positive thoughts is your own sense of peace, happiness, and joy, and of course, talk about having an impact on being a highly successful leader, this does it. We work on this at Becoming your Best, I assure you. We are working on NO NEGATIVE comments, or words of any type. This is not thinking them in our mind in the first place, but thinking all the way on the positive side of the ledger. An example of this, I was in the office, not long ago, and was reading a news article about someone who had made, what appeared to me anyhow, an incredibly bad choice, by embezzling money from their company. I said out loud, in the office, “What a dummy!” Rob quickly responded, “No negative comments, dad!”. I laughed. He was right. How did that negative comment I make, help me or anyone else around me? And frankly, time is too precious to waste on the negative, especially multiple times, 365 days a year. So, what is the value of the compound impact of saying three negative words a day? It is 1,000 negatives a year! And so, just imagine replacing those negatives with positives, with three positive words a day. That is 1,000 positive words per year. And what is the compound, the CI, of that? The fact is, it is huge! Steve Shallenberger: What is the compound impact of living the Becoming your Best 12 Principles of Highly Successful Leaders? They are designed to be lived 1 X 365 X 10, 20 or 50 years. The value of the predictable impact is that you would be better in every area of your life at an increasing rate, this exponential rate. In other words, one day you wake up and you’re just better at a lot of things. In an ever-changing world, the need to continue to improve, to change your skills and your mindset with CI, have never been greater. The alternative is like a friend of mine said, “If you are not moving ahead, you will get run over, and left in the dust”. By the way, one of the most powerful of the 12 Principles, because it brings to bear the other 11, is Pre-week Planning. It is such a simple, yet enormously powerful process. 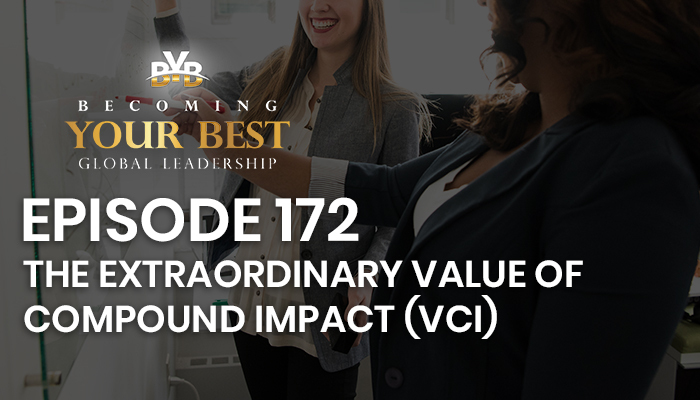 Steve Shallenberger: So, What can you do, as we wrap up, and give some thought to this discussion today, to develop the habit of using the value of compound impact in your life? There are some things you can do today to set yourself up to win! Here are just four. Number one is instituting into your life a principle a week and a motivational daily thought, and this literally is the definition of the process of the Value of the Compound Impact, just doing that simple thing. To help you develop these power-packed Becoming your Best Principles into your life, Becoming your Best has developed for you a personal “compound impact” system to reflect and work on one principle a week, and then move on to the next one, the next week and through all 12 Principles. On the thirteenth week, reflect on your progress. How have you done with each of the principles? And with inspirational stories attached to each one and a call to action, you can do this four times a year, 4 X 13=52 and you can work on these throughout the rest of your life. In addition, you are provided a one or two-line daily motivational quote to just give you that little punch. That’s what we’re talking about, that impact that with time, exponential impact. Together, the weekly message and the daily quotes are a tailor-made COMPOUND IMPACT program that will serve you faithfully throughout your life. This is a service that we provide on a complimentary basis to the entire world. This simple and invaluable process helps YOU to set up a fun, inspirational, on-going program to master the 12 Principles of Highly Successful Leaders and especially Pre-week Planning. Steve Shallenberger: Many of you, who are listening today, may be receiving those emails now. I have now been receiving them for the last five years, and I can tell you, I look forward to them. If you are not currently receiving them and would like to receive them, simply write to us at support@becomingyourbest.com and Murphy will send those out to you, right away. He’ll set them up, for you, your spouse or partner, family or team. There’s no cost to it, it’s free to you. And this is one of the most important actions you can take in life. So, talk about the value of compound impact, and this is a perfect example of it. If this is something you would like to set up for you, just email us at support@becomingyourbest.com and request the weekly/daily messages. I know that you will enjoy them. And if they don’t work out how you thought they would, you can always unsubscribe to them. That’s one thing that you can do. That’s an action that you can take today. I’ve got three more, they’re very simple. Steve Shallenberger: Another that you can do is, be sure that you are working on a healthy diet and regular exercise. And do things that you love! This will help make your program sustainable. A third thing is, in terms of the spirit of CI, is just be determined that every single day, you’ll treat people with respect and consideration. Be nice, patient and kind. And the last one, that I’ll suggest today, is keep learning, reading, listening to podcasts, like you are doing today right now, TED talks, etc. This will stoke up your mind, they’ll fire your intellect up. As you work on investing in your life, with some of these few key actions, I just suggested four, right? Be sure that you have set up the regimen of a weekly leadership thought, one of the 12 Principles of Highly Successful Leaders and an inspirational, motivational, daily thought. Number two, work on a healthy diet and exercise. Three, treat people with respect and consideration, and four, keep learning. Now, as you work on investing in your life, with these things, they will work magic in your life. And it is NEVER too late to start. Why? Because it is about Becoming your Best. You can start fresh today, regardless of wherever you were yesterday. That is why failing is such a big, positive, sometimes painful, part of life. Failure is a pathway to improvement and growth. So, it’s never too late to start fresh today! To put yourself on a more positive track. Steve Shallenberger: Remember, “Thoughts produce actions! Repetitive actions produce habits! Habits, especially good, productive healthy habits, produce a good, healthy, productive character and destiny in life!” The positive value of Compound Impact will catapult you into a transformational person and a highly successful leader. You are an inspiration. I realize YOU are working on your CI right now! Way to go! Because of your relentless effort, you are receiving the value of compound interest now! It is impacting your own life with greater happiness, joy, and prosperity, and whether you realize it or not, you are a positive light to all of those around you, especially as you just keep working on it! Steve Shallenberger: I hope that you’ve pulled an idea or two out of today’s podcast. We wish you all the best and remember, you make a difference every single day of your life! This is Steve Shallenberger, wishing you a great day!